An Edinburgh university student stabbed his mother 30 times in a frenzied murder bid at their home. Kyle Morrison, who attended Heriot Watt University, pounced on Sharon Morrison as she returned to the flat in Jordanhill, Glasgow last August. Kyle Morrison stabbed his mother 30 times in the frenzied murder bid. Pic: Police Scotland. A judge heard Morrison struck having earlier written about hurting his mum. 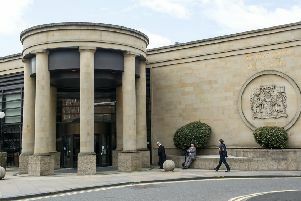 Today, he pled guilty to an attempted murder charge at the High Court in Glasgow. The first offender will learn his fate when he returns to the dock next month. The hearing was told Morrison and his mum had enjoyed a “good” relationship while growing up. But, in the days leading up to the attack, the Heriot Watt student penned letters about harming her. Prosecutor Lynsey MacDonald said this included “setting out in detail” a plan to kill his mum. This involved hiding in her closet, stabbing the woman and strangling her “if necessary”. Ms Morrison was then set upon last August 22 after finishing work. Her son was staying with her after he left his student accommodation in the capital. As she went to get changed, Morrison suddenly appeared in her bedroom and started lashing out with a knife. Morrison went on to put his arm around his stricken mum and began strangling her. Morrison eventually left his blood-soaked mum – and went into his own room to play music. Ms Morrison lay injured for around 20 minutes believing she was going to die. She begged her son to call an ambulance – but he said he would do it when he was “ready”. Paramedics went on to discover Sharon still on the floor of the upmarket flat. Morrison was arrested in Edinburgh the next day. The court was told Morrison is currently in the State Hospital at Carstairs on a treatment order. Morrison will remain at Carstairs as sentencing was deferred for reports.